FEBRUARY 16--For a few days at least, Tim Wehage appeared to be the country’s most reckless driver, a 20-year-old knucklehead who climbed out the driver’s window of a Ford Bronco and stood atop its roof as the vehicle sped down a Florida interstate. Wehage’s dangerous stunt, known as “ghost riding the whip,” was, of course, filmed last month by a buddy driving behind him. The clip was then uploaded to YouTube, where it was discovered last Friday by Gawker and, in short order, went viral thanks to stories on other blogs, local TV stations, and British tabloids. Nobody, though, thought to ask Wehage, pictured above, and his cohorts if the stunt actually occurred as depicted on the YouTube clip. 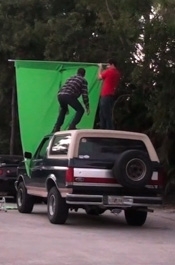 As it turns out, the “ghost riding” never happened, it was a green screen-aided creation of Wehage and his friend P.J. Selzer, a 20-year-old film student at the University of Central Florida. Below you’ll find the original 55-second YouTube clip as well as raw video provided to TSG by Selzer. Selzer’s footage shows that he filmed Wehage driving the car along Interstate 95 in Jupiter. At all times, Wehage is seated behind the wheel of the vehicle, which was going about 40 mph. Then, with the Bronco parked in his parents’s Jupiter driveway, Selzer videotaped Wehage climbing out of the driver’s window and standing atop the stationary ride. With his father manning the camera, Selzer stood behind Wehage holding up a green sheet. Selzer’s stepmother can be seen holding a fan pointed at Wehage to approximate the wind that would be purportedly blowing through his hair and clothing as he surfed on the roof. Selzer, who runs 265 Productions with classmate Zack Spear, said that the “riding the whip” video was not an attempt to trick anyone into thinking Wehage had actually risked his life. Wehage noted that the clip, which had been intended for friends and family, was only viewed about 100 times during the first month it was on YouTube. Submitted by captain_pudding on Sun, 2011-02-20 14:10. Wait? People seriously thought this was real? Either the guy ghost riding was about 4' tall or it was an obvious fake. Submitted by PBSCRAIG on Thu, 2011-02-17 14:01. Kudos to this kid. Nice to see a young person using their creative abilities for POSITIVE entertainment. I want to buy a ticket to his first feature film. Submitted by fldigger on Thu, 2011-02-17 08:01.
always had to be a fake...Let's face it - there's no American made car that rolls in a straight line with no one at the wheel. Submitted by The Pict on Wed, 2011-02-16 12:48. Submitted by SlamDance_Karma on Sun, 2011-02-20 11:19.